It doesn’t have to be that warm outside for a car to become dangerously hot inside. Here are some important facts from Petfinder to remember. Herkimer has been adopted by a wonderful family! He loves his human siblings. Each month it costs Canine Charities approximately $2,600 for food, veterinary care, medications, personalized training and attention, caregiving, etc. to care for our rescues. That’s over $30,000 a year. 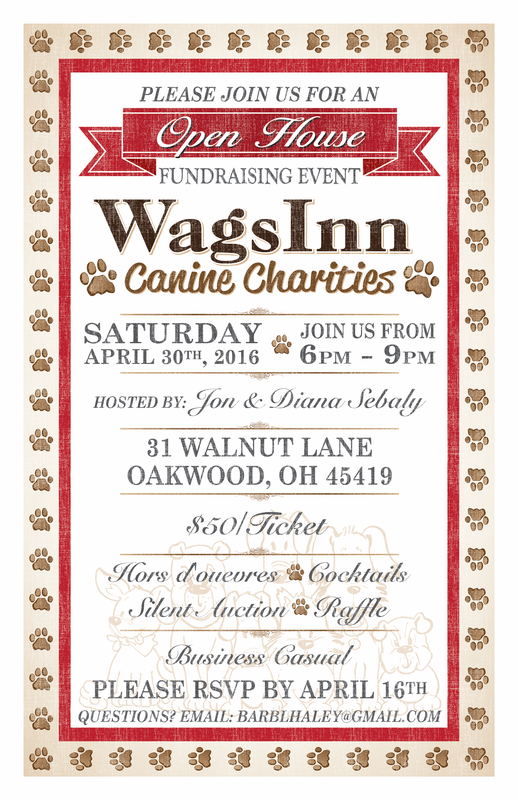 On April 30, Diana and Jon Sebaly of Oakwood graciously opened their home to host the first official fundraiser for WagsInn Canine Charities. 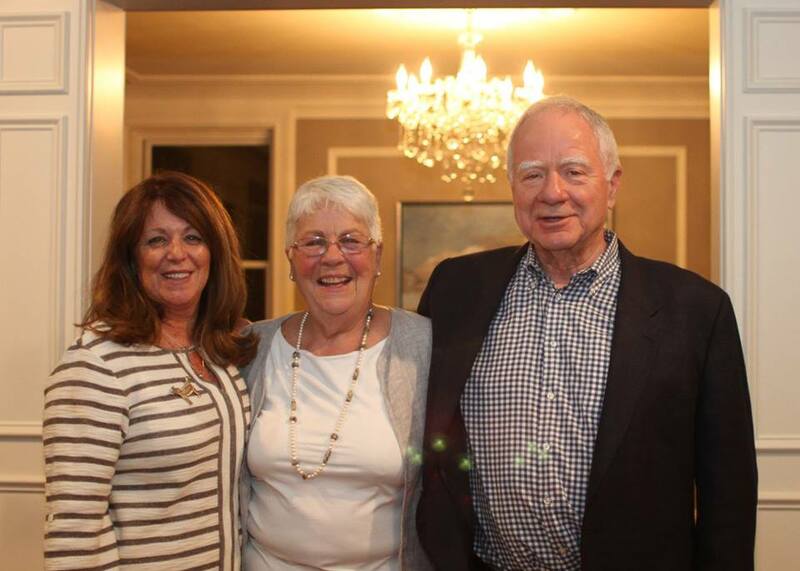 More than 130 guests attended a fun-filled evening of music, food, silent and live auction, and great company. Your generous donations of over $30,000 will help unwanted dogs find forever homes. 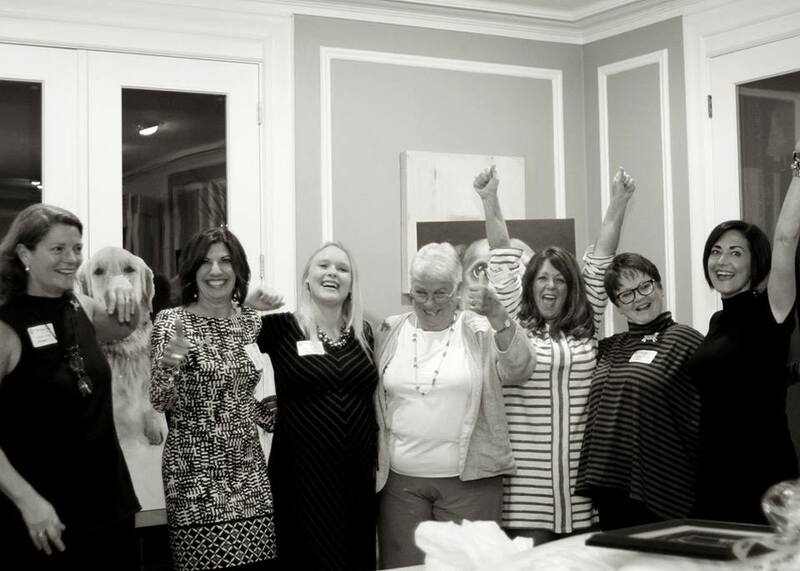 Thank you to the planning committee of Diana Sebaly, Barb Haley, Lesley Neufeld, Tracey Schumann, Tiffany Ebersold, Lori Houseman, and Betsy Woods. Your time and talents are greatly appreciated. 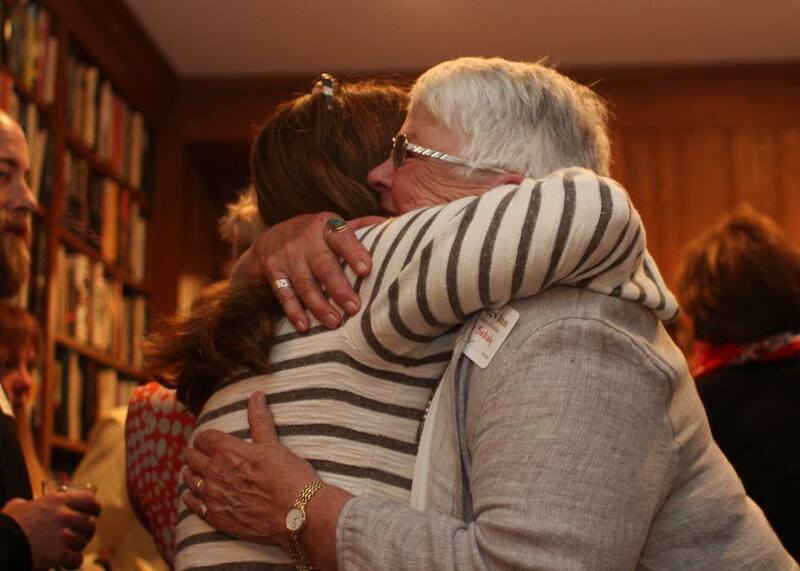 We look forward to our next event and hope you will join us. Thank you from the bottom of hearts. Dog people are the best! National Dog Bite Prevention Week is May 15-21. According to the American Veterinary Medical Association more than 4.5 million people in the U.S. are bitten by dogs each year. Almost 1 in 5 people bitten by dogs require medical attention. Every year, more than 800,000 Americans receive medical attention for dog bites; at least half of them are children. Children are the most common victims of dog bites and are far more likely to be severely injured. 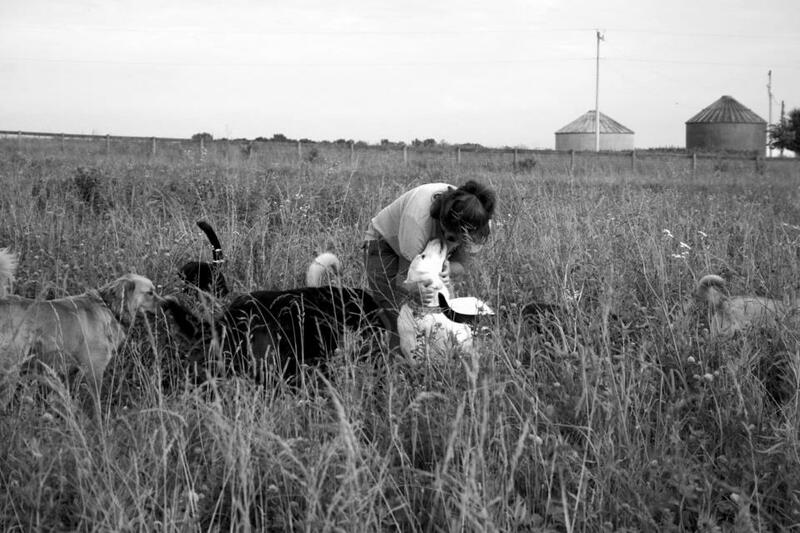 Most dog bites affecting young children occur during everyday activities and while interacting with familiar dogs. Senior citizens are the second most common dog bite victims. Dog bites can occur at any time. That’s why it’s important to pay attention to a dog’s body language. Never disturb a dog while she’s sleeping, eating, chewing on a toy, or caring for puppies. Be cautious around strange dogs. Always assume that a dog who doesn’t know you may see you as an intruder or a threat. Happy Mother’s Day to all of the human and dog mamas! You deserve to be celebrated every day. We found 10 of the cutest videos of mama dogs and their babies. Enjoy! 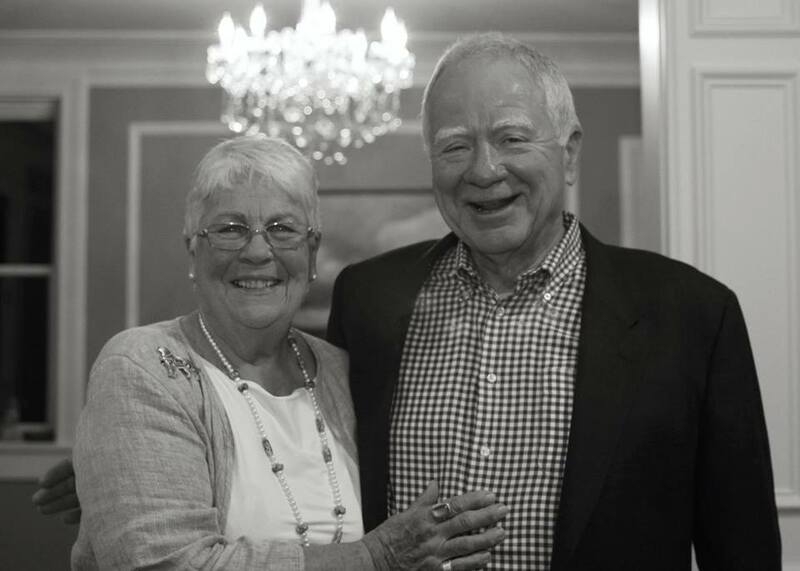 On Saturday, April 30, from 6-9pm, Diana and Jon Sebaly are graciously hosting an open house and fundraiser at their residence (31 Walnut Lane, Oakwood). Tickets are $50 per person. RSVP by Barb Haley at barblhaley@gmail.com. Street parking is available, but NOT on Walnut Lane. All of the money raised will go directly to our non-profit Canine Charities rescue organization to help unwanted and abandoned dogs find their forever homes. Each month it costs us approximately $2,600 for food, veterinary care, personalized training, bedding, caregiving, etc. to care for our rescues. That’s over $30,000 a year. Basic supplies every dog needs – collar, leash, treats, toy, flea and ticket preventative, etc. On Friday, April 22, we’ll celebrate Mother Earth. Without respect and care for our beautiful planet, we would not have a space for our canine companions to run, play, and explore. Go for a walk or a hike. Take your dog to the dog park, for a long walk in your neighborhood, or explore a new hiking trail. We are blessed to have many beautiful parks close by. For a list of parks in Southwest Ohio visit http://trekohio.com/sw/. Plant a tree in memory or celebration of your dog. What a better way to honor your devoted companion? For a minimum $10 donation, the Arbor Day Foundation will plant a tree in honor of your pet. It’s that simple! Learn more. Donate unwanted items to your local pet charity or shelter. WagsInn Canine Charities is always in need of blankets, towels, collars, leashes, toys, and tennis balls. Choose good dog food. Quality ingredients provide better nutrients that are absorbed by your dog therefore producing less waste. When choosing a dog food read the ingredients. The top three natural ingredients should include animal protein (salmon, bison, lamb, beef, turkey, rabbit, duck, or chicken), vegetables and fruits (carrots, potatoes, green beans, blueberries, bananas, cranberries, or apples) and vitamins and nutrients (Omega-3 and 6 fatty acids, Vitamin B, D, or C). Talk to your vet about your dog’s nutrition and diet. Let us know how you celebrated Earth Day with your pooch by posting pictures on our Facebook page. Peace, love, and tummy rubs. April is heartworm awareness month. 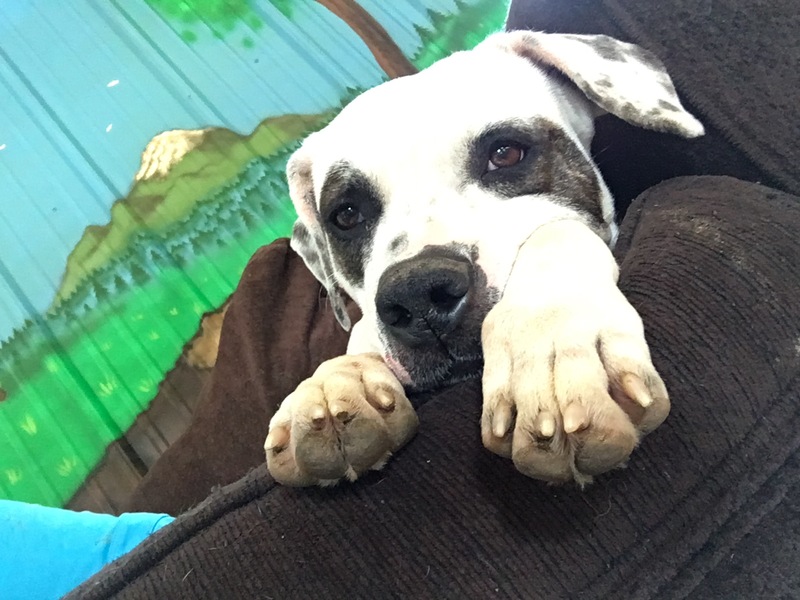 We find this very timely as our newest rescue Penelope was recently found as a stray, starving and neglected, and was diagnosed with a severe case of heartworm. Heartworm disease is serious and potentially fatal. Infected mosquitoes carry heartworm. Dogs bitten by infected mosquitos transmit the parasitic worms. Once a dog is affected, foot-long worms live in the heart, lungs, and blood vessels. Depending on the class of heartworm, symptoms may include labored breathing, coughing, anemia, high blood pressure, exercise intolerance, fainting, and rapid heart beat. However, some dogs may have no symptoms. Heartworm can be deadly if not discovered and treated properly, and often time’s treatment is difficult. It can cause severe lung disease, heart failure, and organ damage and can cost more than $1,000 for treatment. That’s why prevention is so important. Just like you, pets need regular check-ups with their doctor. Make sure your dog gets yearly veterinary exams that include updated immunizations, parasite checks, and heartworm tests. It’s recommended that pet owners should give a heartworm preventative each month all year round. Some pet owners opt out of treating their dogs during the winter months. However, you never know when the first mosquito will emerge or the last mosquito will die, especially with the unpredictable weather we’ve seen in the last few years. According to the FDA, Heartworm has been reported in dogs in all 50 states. Just because you live in colder climates, doesn’t mean your dog is safe. Heartworm disease is completely preventable. It’s much safer and cheaper than treating a case of heartworm disease. Fortunately, Penelope is responding well to treatment and was cared for by one of our foster families during the 10-day wait period. Penelope is now at WagsInn and has a long road to recovery. It takes months to be fully cured from heartworm disease. Check back often to find out how Penelope is doing and when she will be ready for adoption. For treatment options or questions, please contact your veterinarian.